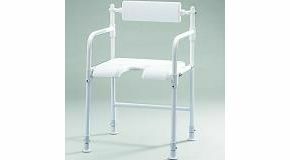 Folding Shower Chair With Back Support And Arms. A simple, easy-clean moulded plastic seat and back provide support and comfort, with a cut-away panel at the front of the seat for easy personal washing in the shower .The arms provide additional security and comfort whilst getting in and out. The chair did arrive with damaged caps on the chair back, but after contacting active mobility I was sent replacement caps the next day . The chair is very comfortable and good for purpose. The chair would have been great but it was to large for my shower tray (My mistake) I sent it back with no trouble at all it was picked up from my house,I got a full refund..I would use Active Mobility again,I would also recommend them. We were very happy with the service and friendly staff who provide a quick, no fuss, understanding telephone desk at Active Mobility. We would highly recommend them thank you for all your help.